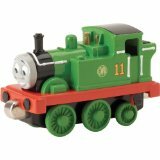 Oliver is considered brave and a good role model by the engines. This went to his smokebox and led to his incident with the ballast trucks, but Oliver has since then learned his lesson and started to behave like a real role model. He is generally laid back and is usually able to avoid the occasional bickering of the engines. Because of this, he is on good terms with all of the engines.